After the disappearance of Richard John Bingham, 7th Earl of Lucan, in 1974 it was twenty-five years before his family were granted control of his estate and it was not until 2016 that the Earl was officially declared deceased. In late thirteenth century Gloucester a man disappeared without trace and it was only six years before his family were given control of his estate. This article endeavours to recount the story of that man, Walter le Breton and his family. The early history of Walter le Breton is unknown and he first appears in the records in 1285 on the occasion of his disappearance. Sometime around 1285 Walter le Breton had three messuages in Gloucester according to the Close Rolls. It is not known for certain where these messuages were located in the town and if they were adjoining each other or scattered. In about 1258 a certain Walter Bruton held land beside the former lands of the Jews of Gloucester which Maud, daughter of David Dunning of Gloucester held and which she granted to William de Watford and Alice his wife, Maud’s mother. But it is not certain if this was the location. The Close Rolls also do not give us any value for the three messuages. A messuage was a general term for a cottage and a garden but they varied in value as they did in size and location. One messuage in Campeden was worth 3d in 1274 while another messuage in the same place was worth 4d. In 1277 one messuage in Tewkesbury was worth 4s. In 1302 Walter le Bret held one messuage and garden at Pychenecombe worth 12d. Elsewhere the abbot of St. Peter of Gloucester had one messuage at La Kingshame paying 6s on rent per year and another paying 8s per year. In 1338 one messuage in Gloucester paid 2s per year in rent while another only paid ½d per year. In 1285 Walter le Breton disappeared without notice or as the records say ‘he secretly left the parts of Gloucester’. It is not known what the circumstances of his disappearance were. Could have been financial, personal reasons or in trouble with his neighbours or the government. People said that Walter had drowned himself but there was no evidence of this. Yet still there was no sign of him alive or dead at Gloucester or elsewhere in England. 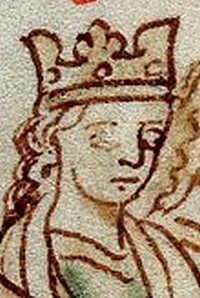 After Walter’s disappearance the bailiffs of Queen Eleanor of Provence (wife of King Henry III) seized the messuages and held them against the claims of Christiana le Breton, sister and heir of Walter. This was against the law and custom of the country as the property was not truly escheats to the crown. Queen Eleanor had a number of property rights in Gloucester. In January 1288 Queen Eleanor got the right to take timber and rods from the Forest of Dene for the repair to her weir by Gloucester. In February 1289 she got the right to have five oak trees from the Forest of Dene for the repair of the bridge of Gloucester castle. On 20th September 1291 an order was issued to Edmund, the King’s brother and co-executor to Queen Eleanor, to cause Christiana le Breton, sister and heir of Walter le Breton, to have seisin of Walter's messuages in Gloucester until Walter returns. The nice thing about this restoration is that in the great scheme of history Walter le Breton may not have moved mountains or become famous beyond the walls of Gloucester. Yet in the time of King Edward, the hammer of Scotland, ordinary people could succeed against the great people of the land like Queen Eleanor. Queen Eleanor was not a popular person, especially in the London area where she was often attacked by the inhabitants. But the restoration was not automatic and another order had to be issued. On 23rd October 1291 a further order was issued to Walter de Bello Campo, constable of Gloucester castle, to restore to Christiana le Breton and John Sage, nephew of Walter le Breton, the three messuages formerly held by Walter le Breton and illegally held by the constable on behalf of the executors of Queen Eleanor. John Sage was not mentioned in the first order of September 1291 and this omission possible warranted the issuing of the October order. If Walter le Breton figures rarely in the surviving documents, John Sage features in many Gloucester documents over a number of decades. In about 1260 John Sage was a witness to the grant by the Leper’s House of St. Margaret near Gloucester to William of Worcester of all the land outside the north gate which the House had received from Henry the Locker. In about 1262-3 John Sage was a witness to the grant by Richard the Blund to the Leper’s House of St. Margaret near Gloucester of three selions of land in the Hamme near Southbrock. In about 1280 John Sage was a witness to the grant by Adam of Northwich of land in the suburb of Gloucester called Newland to the prior of St. Bartholomew’s. John Sage also went by the name of John the Wise. In about 1270 John the Wise (le Sage) was a witness to a grant by Robert the Mercer of property in Gloucester to Adam of Ardene. In about 1284 John the Wise (le Sage) was a witness to the lease by the prior of St. Bartholomew’s, Gloucester to Nicholas Bagod of a tenement in Great Smith’s Street. John Sage was employed as a cordwainer otherwise known as a corvesor or a person who works with leather. In later times the term cordwainer was dropped in favour of shoemaker. The medieval shoemaker was often an independent artisan retailer who catered for a local market using local supplies of skins and hides. After 1350 the economic and social status of the shoemaker increased but John Sage seems to have been ahead of his time in this respect. It would appear that John Sage was a successful businessman and had acquired a number of properties in and around Gloucester. In about 1285 John the Wise (le Sage), burgess of Gloucester, made a grant by John Florye and Celestria his wife of two shops between the two bridges of Gloucester. These shops were located between the land and messuage of Robert Florye. Later, on 27th April 1301, John the Wise (le Sage), burgess of Gloucester, made a grant of two shops opposite the gates of St. Bartholomew’s to John Flory, butcher, and Celestria his wife. These shops seem to be the same premises as in 1285. In 1280 John Sage of Gloucester acquired a lease on one messuage, one ploughland and eight acres of meadow at Brickhampton and Norton from Hugh de Brickhampton. For this John had to pay Hugh 40 marks plus a rose a year along with two marks per year, 5 quarters of wheat, 2½ quarters of barley, 2½ quarters of beans and 10 quarters of oats. 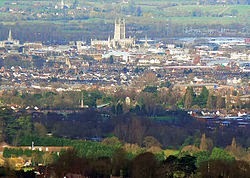 In about 1274 prior of St. Bartholomew, Gloucester, made a grant of land near Grase Lane to Henry of Penedok. This land was situated between the land of John Sage and Walter Haym. Elsewhere it is recorded that on the east side of Grase Lane in the time of King Edward II John Sage held a tenement which was previously held by Henry Silvester (temp. Henry III) and by R. Scott (temp. Edward 1). One door further along the Lane John Sage had another tenement formerly held by Henry Silvester. None of these two tenements appear to be associated with Walter le Breton. Elsewhere in Gloucester, between the north gates on the left side towards Dudstone, John Sage the cordwainer held another tenement in the time of King Edward 1 which was held by Henry Tyche in the time of Henry III. In about 1275-6 Richard Fraunceis, burgess of Gloucester, made a grant of a shop in the Girdlery of Gloucester to Walter of Northampton, burgess. The shop was located between the shop of John Sage and the shop of William Sage. Later, in about 1280, Thomas of Hope and Mabel his wife, daughter of William Cleymund, made of grant of this shop beside that of John Sage, to the prior of St. Bartholomew’s. At about the same time that John Sage became involved in the property of Walter le Breton, he also acquired property from his own family. On 21st September 1295 Walter the Wise (le Sage), son of William the Wise, late burgess of Gloucester, made a grant to his brother John the Wise of all his land in Herlone Lane with houses and bake-houses. This land was situated between the lands of Robert of Cornwall and Walter the Sergeant. On 24th June 1317 John Sage, cordwainer and burgess of Gloucester, made a grant of all this land in Herlone Lane with houses and bake-houses to Dom. Hugh of Neuton, chaplain. On 11th March 1317-8 Hugh of Neuton conveyed the property to John of Thormerton and sold to John of Thormerton all his movable and immovable goods. The business success of John Sage not only increased his property portfolio but also increased his standing in the civil life of Gloucester. In about 1280 John Sage was one of the two bailiffs of Gloucester with Walter Seuare. As part of their office the two bailiffs were chief witnesses to a number of land deals in Gloucester in that year. In 1311-12 John Sage was a witness to the grant by Adam of Tudenham of land at Leuydiecroft outside the north gate of Gloucester to Alexander the Soiurnaunt. On 22nd April 1318 John Sage was a witness to a grant by Alexander the Soiurnaunt of a tenement in Newland without Gloucester to Robert son of John the White. On 12th November 1336 John Sage, cordwainer and burgess of Gloucester, made a grant of a mark of annual rent on a tenement between the north gates of Gloucester to Audoen of Wyndesore, burgess. This tenement was located between the tenements of John of Northwich and William the Cutler. After 1336 John Sage disappears from the records. He was doubtless an old man by that time and had seen many changes in Gloucester and in his own life over the previous decades. It is not known if he left any family as his property portfolio seems to have passed to other people in later years. Yet as women change their surname on marriage it is possible that these people with other surnames were relatives of John Sage. As for the three messuages of Walter le Breton their location and history is still difficult to tell. Maybe some future documents may tell some extra information to enlighten the story. The same could be said of the fate of Walter le Breton and his disappearance, although this is possibly more difficult. Yet something of his life before 1285 may come to light – something for another day.